Keep the Mass in Christmas. James, you’re such a heathen. I suppose you’re one of those unholy people praying thanks to God and taking Communion at midnight on Christmas than sitting at home, watching TV, and overreating, like the rest of us holy, spiritual people. I mean, really, you just don’t know how to celebrate Christmas… and yes, I said, CHRISTmas. I’m so spiritual, I plan on being in bed by 9:30…after making the meeting with the Moose guys and getting my fill of wings and cheap pop. And beer. Don’t think we don’t know you’re having beer. 😉 Shoot, HF’s FOP lodge has the biggest bar in the world… ha ha. I like the way you think…put me down for a pony keg of your best import. Natalie ~ Yuengling?! Pottsville, perhaps? I’m in Hazleton. Just moved here from IL. Christmas is the ultimate fundy holiday, because they are the only ones who do it right (in their mind, of course). Catholics and other liturgical traditions spend way too much time focusing on the peripheral people in the story, like Mary and Joseph. Cultural traditions about Santa, yule logs and sleigh bells in the snow are just tools of Satan to keep people’s minds focused away from Jesus. And of course retailers (the very ones who are trying to take Christ out of Christmas) are only interested in Christmas for the money they can make. To fundys Christmas is all about Jesus coming so that He could one day die. If you remind everyone time and again that Christmas presents are reminders about Jesus who came so that He could one day die, then that is OK. But the most important thing to have at Christmas is a big musical production so that all those people distracted by reindeer and buying presents will realize that fundys are right and they were wrong. I was attempting to speak from the fundy mindset, for those who may be concerned. I personally think the Christmas story is a beautiful example of God coming to earth in the most unlikely way possible, and to miss the elements involving His parents and the others who came to see Him is to miss the lesson God wants us to learn. I also appreciate the fact that American culture, while certainly misguided in some of its emphases, goes nuts over Christmas. I think it’s wonderful, and wouldn’t have it any other way. It should be worth mentioning that Christmas would be more accurately celebrated during Succot – or late September. I think your sense of the “rightness” of Christmas in December reflects the age-old schism between the real and the factual of Fundamentalism. Centuries ago, the best thinkers worked on the premise that the “real” world is made up primarily of things unseen, but the “real” world is where the meaning is. The tangible world, the world we see and feel and bump into, is the flimsy world, the world that passes away. If you are a fan of CS Lewis you may recognize what I am describing as “Shadowlands.” In the material sense, we live int he Shadowlands, the world that passes away. That being said, Fundamentalists go for the “facts” of the birth of Christ, trying to track down the date. But the date doesn’t matter. If Christ were born on, say, April 17 of 4 BC, then every successive April 17 is still no different. The factual calendar cannot be inspired by the real birth of God as man. But that concept of the shortest, darkest day that is the most remote from the sun does have a hook in the realness of Christ’s birth. When the world was at its darkest and most remote from light, God gave us Light, the Light of the World. Every year we see it again: the darkness slowly being enlightened. In that sense, December 25 is far more “real” as a commemorative of the birth of Christ than the actual calendar day, the factual day. Ah, true, but then you’d be standing on your head, as people south of the equator do…(to keep their world rightside up)…. The truth is that nobody knows the date, or even the season, when Jesus was born. I’ve heard arguments for why it was probably spring or summer, and now one for fall. The date is a whole lot less important than the fact that we celebrate the birth, though. A priest at the church I attended while in college once said that while it’s unlikely that Jesus was born around the time of the Solstice, it did make sense for us to celebrate his birth then, because his birth brought light back into the world. Well, since no one has given you an argument for a winter birth of Christ, I suppose I’ll have to do so hereâ€“and hopefully justify our traditions just a bit. In the first place, it’s important to note that a late Dec-early Jan date has been related to the birth of Christ since the time of the Church Fathers. Men who studied under the men taught by the apostles, though they did not celebrate Christmas as a holiday, do mention that time for his birth. This in no ways proves anything relative to the time of Christ’s birth. However, they concept that this date was invented in the late middle ages by Catholics trying to replace the winter solstice is simply not true. Now, as to the viability of a winter birth. The clue for us is contained in the Scripture’s account of Zechariah (John’s father). The priests at the time of Jesus birth served in the temple in a rotation. This rotation was designed to ensure that priests from Jerusalem didn’t get too “uppity,” as we Southerners say, because they were the ones able to serve in the temple. Every priest belonged to an order, and Zechariah’s was the order of Abijahâ€“the eighth in line. We know that the order of Abijah would have served in the temple during the first 10 days of October of our calender. Zechariah and Elizabeth, along with the other families in this order, would have traveled together to Jerusalem to serve in the temple. Assuming that John was conceived not long after Zechariah and Elizabeth’s return journey, we have a mid-Oct conception for John the Baptizer. Certainly he could have been conceived much later, but there’s no real reason to assume so. We are told in Luke 1 that Elizabeth hid herself for 5 months, taking us to mid-March. (Oct to Nov=1, Nov to Dec=2, Dec to Jan=3, Jan to Feb=4, Feb to Mar=5). As she is running into her sixth month in Luke 1:26, the angel comes to Mary and announces the coming birth of Christ, specifically referencing Elizabeth being in her sixth month. (Assuming, of course, that there is no big gap between Luke 1:25-5 and verse 26 so that the angel could have said “it is now almost through being six months with her who was called barren.”) Again assuming that no long period of time passed between the announcement of the angel and the conception of Jesus, this puts His conception in mid-late March. Nine months from mid-late March is mid-late December. Proof of Dec 25 being the exact date? No. There are some assumptions here: that John was conceived no later than a week after Zechariah and Elizabeth’s return home; that the angel came to Mary as Elizabeth was passing from her finished 5th into her 6th month; that Mary conceived not long after the angel came to her. But all these are perfectly legitimate, logical assumptions. This is quite trueâ€“ordinary shepherds did not keep their sheep in the fields during winter because of the heavy rains. But temple shepherds did. Certain flocks on the road between Bethlehem and Jerusalem were kept for use in temple sacrifice. They were out all year round. It is interesting to note that ordinary shepherds were under a rabbinic ban. Their manner of life made it impossible for them to keep all the strict legal observances of rabbinic Judiasm. As such, they were considered unreliable witnesses and were not frequenters of the temple. The temple-sheep shepherds, however, were not under this ban. They were considered reliable witness, and, if they were the ones to receive the angelic message, would have taken the news to the temple when they resumed work after seeing Jesusâ€“preparing Simeon and Anna nicely, too. I really refuse to buy into “everything else” as being a tool of Satan to misdirect everyone away from Christ. Retailers take advantage the season to make money…because that’s what they do. As a matter of fact, Fundies could same themselves much heartburn if they simply remember that the unredeemed will ACT as that…unredeemed and their actions shouldn’t take anyone unaware. So, with that in mind, the hooping and hollaring going on behind pulpits about Rudolph’s red nose is just the ranting of a madman. Fundamentalism is all about the knee-jerk reaction and not about substance. The key to remembering the meaning of the holidays is through the individual family, the church be damned. Well said. What’s the word that comes to mind?… Ah, yes, sensationalism. The way they paint it, you can just imagine retailers and everyone not fundy-approved sitting in their dark homes surrounded by candles and sacrifice tables praying to Satan to show them the next thing to come up with. Yeah, they meet…while it’s not Area 51, it is the sub-teranian level of the abandoned and seemingly harmless, Union 76 gas station EXACTLY 33 miles south of any given town…33 paces from the “X” in the parking area to a stairway 33 steps below to a door that must be knocked briskly 11 x 3 times (33…if you’ve not figured it out, the local Masonic Lodge is heavy into this…in the absence of the Masons, they have outsourced to the guys at the Moose Lodge) where upon you will be granted entrance into the “secret” room (the oil change pit) where you will be greeted to hot wings and K-Mart brand cola and the agenda for the meeting. First on the agenda: See if the Anti-Christ is free for a promotional appearance this coming Easter…. I forgot the all important “secret” handshake…something you would see on a Three Stooges film…whoopwhoopwhoop! HAAAAAA! Win! Blue Cheese ROCKS! About your comment to the Pastor’s Wife…I was just like how you described yourself. I was so uptight I was probably the first walking diamond mine. Negative? I looked at EVERYTHING in the worst light; I put the worst construction on EVERYTHING…sometimes, I find myself struggling with that very same thing because I was raised in a negative atmosphere. ROTFLMAO! You just made my morning! Now, that deserves a big HAY-MEN!!! I know that I am enjoying a shift in my perspective: from always being outraged about something to focusing on being loving, joyful, peaceful, patient, self-controlled, etc. and trying to find ways to show love to people. I still feel my heart rate rising when I see articles like “The Joys of a Godless Christmas” (grrrrr) but I know I’M not in charge — God is sovereign. He can defend His own name. I just have to love – and I try to remember to PRAY in those situations where I’d formerly get mad. I remember always being uptight about things, too, and looking for the wrong in things. Looking back, it seems that I wasted SO much time. It was a freeing day when I realized that not everyone or everything was demon-possessed. I was the same way. The moment that I realized that I was the epitome of a pharisee and that I was so sorry for living my life that way was the crux of my spiritual journey. The saddest thing of all was that after 10 years in the IFB I didn’t realize what a pharisee really was. I always thought a pharisee was one that taught the law but didn’t keep it. In reality, it was a version of my IFB-self. I taught the law, kept it fairly well but had a heart of pride and egotism that blinded me to the real needs of others. I was a whited sepulcher full of dead men’s bones, more concerned that those I was “ministering” to were keeping the rules rather than meeting the Loving, Merciful Savior. I think what started waking me up from fundyland was when I worked in the bus ministry at my fundy u. I know that’s very fundy, and it was, but what got me was the inner city kids. Some of them had parents who were crackheads and loved any bit of attention they got. It broke my heart so bad. Some of them would cry and cry because they didn’t want me dropping them off at their Sunday School class, but wanted to stay with me. And, when we showed up to pick them up, they’d run out of their houses. It was then that I started realizing that fundyism wasn’t the answer for these kids or for people in general. What was needed was real, unjudgmental, unconditional love. What was funny was that I was so green when I started working the bus ministry, and I worked in The Hood. Luckily, I got paired with someone who was from a bad part of LA, who taught me how not to get myself killed… ha ha. PW, when you see “the joys of a godless Xmas”, just say, good for them, they get to enjoy it too. It doesn’t take anything away from you unless you let it. My wife and I both agreed. It is sooooo freeing to focus on things that matter and not what’s wrong with everyone. I felt bad for my mom and for those trapped in that world. Some people may think they enjoy looking down on others and busying themselves “pleasing” God. They don’t know what they are missing. hay-men from over here, too. That last paragraph absolutely resonated with me. I was there with y’all, too, looking for things to be offended over or avoid that it was no fun at all. Now I (try [key word]) to just relax and not be offended by everything that I not only don’t agree with but may just not be my taste. My favorite comic book as a child was the “Lobo Christmas Spectacular,” in which the Easter Bunny hires Lobo, a ruthless murder machine, to take out Santa. Most of the images are of elves dying in highly improbable and needlessly gory ways. Now that’s a war on Xmas. Now, I hope you are aware that up until very recently, Lobo had seen the “light” and become a pacifistic prophet of the Triple Fish God. Yeah, that didn’t last long. Also, in the Pagan community, we routinely refer to the followers of the Nazarene as “Xians.” It’s just faster. Judging by Facebook, I’d say it’s not just Fundamentalists that get this one wrong. 57% of all debunkers on this site won’t have the courage to cut & paste this to your own comment. Colbert always hits the nail on the head. Thank you for this. So true, it kills me how people just take up the martyr cause and don’t even take the time to study things out. It doesn’t take much, it just takes any at all. I love mornings like this. Of course, traditionally you shouldn’t put up the tree until Christmas Day (or Christmas Eve, if you must), and you should take it down for Epiphany (January 6 in the Western churches). Setting it up earlier and earlier is something we get from the retailers who want to encourage everybody to buy Christmas stuff over as long a time as possible. Eh, I’ve always liked to set it up the first week of Christmas. My parents always waited until the week of and it bothered me, so I do mine earlier. They keep their’s up until New Year’s, but by Dec. 26th, I hate it all and want it all gone. We’re getting our tree up today – I hope. We didn’t wait this long because we’re particularly traditional, but just because I always put things off to the last minute. Not good. Of course, that means I should get off the computer and start working. Then again, I’m groggy because I watched the first half of the lunar eclipse last night. Yawn. I meant “yawn – I’m tired” NOT “yawn – the eclipse was boring.” It wasn’t. It was amazing. I just wish the clouds hadn’t moved in. AGH! (in a very Charlie Brown way) I missed it!!! I was wanting to see it. I’m betting though that there’s a conspiracy theorist fundy out there who will think it’s a sign of god and the end of the world!! @Lizzy F.: I told my (fundy) mom earlier today that I was disappointed I wasn’t able to see the lunar eclipse last night, thanks to the clouds, and she said something about the moon and this being the end times. 🙄 I just bit my tongue and didn’t say anything. It was a much-needed reminder that there’s no way I could go back to fundyland *and* keep (what’s left of) my sanity! The cognitive dissonance would drive my insane. There have been lunar eclipses regularly approximately since time began, so why would this one (and none of the previous ones) mean we are in the End Times? Please tell me Snots is an animal, and not your spouse, child, or adult relative. I hear Snots and I think of National Lampoon’s Christmas Vacation and the dog, Snots. Correction: His name was Snot. But still. I am just about ready to take down ours because I can’t keep our two cats out of it … seems like every time I turn around there’s a cat in the tree. My cats think the tree is their own little woodland. They are indoor cats so it is a big thrill for them. They climb it, drink out of the base, bat the ornaments off and then curl up and take a snooze under it. As Darrell’s comments imply, there’s an almost-perfect negative correlation between literacy and being offended by the use of “Xmas” for “Christmas.” In other words, the less you know about the spelling “Xmas,” the more likely you are to be offended by it. The irony is that all, or at least almost all, of the theologians and seminary students I’ve known (and I seem to have known a lot of them) use “X” to stand for “Christ” or “Jesus” in their own notes. When you write a word many times every day, it just makes sense to use a single, easily-drawn character instead of writing out the word. You aren’t likely to find any mathematicians who write out the names of numbers and functions instead of using abstract symbols. This happens a lot in Fundyland. The people that get the most offended are the ones that do not know much. However, as Paul reminded us, our purpose should not be so much provide them with knowledge so much as the LOVE of Christ that they’re not used to experiencing. I’m a seminary grad and a pastor of a NON-fundamentalist church in a NON-fundamentalist denomination. This is just about the dumbest argument the fundies make. Seminary students and theologians abbreviate with Xmas, Xnty, Xns, etc. The “X” can be considered the Greek letter Chi, or the first letter of Christ. If we deny him before men than he will deny us before the father. Abbreviating Christ is a slippery slope to Denying Christ. Slippery Slope you liberal non-fundamentalist Pastor or should I just call you P for short? Apparently I’m not committed to God, I’d rather be politically correct because I DARED to say “Happy Holidays” to some piously religious Christian who felt the need to tell me it was Christmas. This was last week, and I told her it wasn’t Christmas yet, some people were celebrating Hannukah or advent, and then there is also New Year right after Christmas. That means “holidays” not just one particular holiday. Last week was Advent, not Christmas. I have been wishing people all kinds of things. If they say “Merry Christmas” to me, then I return it. If they say “Happy Holidays,” then I’ll wish that back to them. I’m pretty sure if someone had wished me a Happy Hannukah or Kwanzaa, I’d have wished them the same, even though I don’t celebrate either of those holidays. Making a big deal out of saying “Merry Christmas” instead of “Happy Holidays” or some other festive greeting only emphasizes ignorance and a judgmental spirit, the very antithesis of the holiday season. I wish you a Happy Harmonica! persuasion of your choice, but with respect for the religious persuasion of others who choose to practice their own religion as well as those who choose not to practice a religion at all; plus… A fiscally successful, personally fulfilling, and medically uncomplicated recognition of the generally accepted calendar year 2011, but not without due respect for the calendars of choice of other cultures whose contributions have helped make our society great, without regard to the race, creed color, religious, or sexual preferences of the wishes. actually implement any of the wishes for her/himself or others and no responsibility for any unintended emotional stress these greetings may bring to those not caught up in the holiday spirit. Ok, so actually I just say Merry Christmas – thats what I happen to celebrate, deal with it. I don’t really give a Mog’s rear end about what other people think and have no problem with how they choose to celebrate their holiday of choice, and they should give me the same lack of concern. I remember my father fighting a losing battle about this. He was a HAC graduate but he had the ability and inclination to read. He tried very hard to teach our church that saying Xmas was not a bad thing. Didn’t work. Put Saturn back into Saturday? Put the Sun God back into Sunday? Yes, also the Moon back in Monday, Tyr back in Tuesday, Woden back in Wednesday, Thor back in Thursday, and Frey back in Friday. And Janus back in January, Mars back in March, Aphrodite back in April, Maia back in May, Juno back in June, and Julius and Augustus Ceasar back in July and August. This is written by a Russian Orthodox priest. On FB last week, a friend posted that she listened to 2 “Christian” radio stations where they were blathering on about “The War on Christmas.” She turned her radio to another station and heard nothing but Christmas music. Mmm. Maybe the war is just a straw man designed to keep people angry, fearful, and, the money coming in. I don’t want to be needlessly angry – “the wrath of man works not the righteousness of God” – or fearful – “perfect love casts out fear”. “Fear not!” the angel said. I hate to disagree with you, Darrell, but the X has been used for much longer than that. I do believe Constantine, in his all-pervading wisdom in forcing people to becoming Christmas, used the X on his shield as he killed pagans. Are you telling me that Wikipedia lied to me??? I believe which christogram he used is disputed between the X and thbe Chi Rho. If I recall correctly, the OED has “Xmas” as an abbreviation for “Christmas” going back about 500 years; “X” as an abbreviation for “Christ” goes back at least 1,000. We have to remember the Fundies, the Fighting Fundies especially begin with the premise that America is God’s Chosen Country, We Americans are God’s chosen people in this dispensation. That obviously being the case then, Christmas and Christmas trees and Christian Flags, and Christian ___________ (fill in the blank) are God given RIGHTS to this Christian nation. To “X” Christ out of Christmas shows the pagan infulence on our Country and we have to take it back! So.. to rally the troops there is the anual “Reason for the Sean” campaigns (rather ironic given the lack of reason in the Reason campaigns) and the all out battle to keep “Christ” in Christmas! Remember the Christian Alamo and all that rot. …even Scrooge learned that to keep the spirit of Christmas it must be kept in his own heart first… maybe that’s why the Fundies hate Dickens so much, he exposes too much light on their darkness?? Way to spoil the ending of A Christmas Carol for me Don! I didn’t know the “X” in Xmas was for Christ until last year. I felt like a great weight had been lifted and I no longer had to be angered by it. It was also a big “duh” moment for me because I was in CHI Kappa Delta at BJU and knew the Icthus (spelling? IXOYE to transliterate my poor memory) letters so just DUH. The dots were not that hard to connect but I still needed someone to do it for me. Wait. You went through a Christian Bible college, and NOBODY ever told you that “X” has been used to stand for “Christ” (or Greek Christos) for over 1000 years? Do you think you might be able to get your tuition refunded? I’d ask but don’t want to ruin my no-contact-with-that-place streak. I took Greek at BJU and was never told that X stood for Christ. Everyone there was big on the not taking Christ out of Christmas bit. I was even in Theta Sigma Chi and our slogan was “Together Serving Christ;” I just thought it was a clever bit of alliteration because I didn’t know X meant Christ. It wasn’t until I started reading non-BJU-approved authors that I learned this and got over feeling sad or slighted when I saw Xmas. He would also tithe every time he passed go. I thought it was well done, and I enjoyed reading the history behind “X-mas”. (I don’t know how to make links here, or else I would have done so) – sorry. I discovered in college that the X stands for Christ and also felt like I’d been duped all this time into believing that the “world” was trying to remove Christ from Christmas. (Not that he was likely there in the first place, anyway.) So I posted a status about it not too long ago and talked about the real meaning of the X. Several fundies commented about how Christians should be keeping Christ in Christmas as much as possible and how those who are trying to take out Christ are just picking on true Christianity. Yet these same people have Christmas trees in their homes which was originally pagan, or so I’ve read. Sigh. Fighting ignorance is just a losing battle. There… much better. I hope. I had this very conversation with my younger brother and sister yesterday! My sister reported that our mother told her Santa = Satan, and I went off on a small soapbox rant about fundy views on Santa and Xmas and the whole Christmas thing. They listened and it was a good talk. So nice timing, Darrel. Fundies need to take the “mas” out of Christmas. Because “mas” sounds too much like Catholic “mass”. Just say “Merry Christmahannukwanzika”. Then you’ve got them all covered. Yes! Festivus for the rest of us. I think Festivus would be a perfect Fundy holiday. You sit around the table at the end of the year and tell every one else their short comings. Festivus is also perfect for anti-Christmas tree and decoration fundies. All you need is a pole. Well, that didn’t go under Dan Keller’s message at 12:03, like it was supposed to. George, cut it out! I was listening to an AFA (not fundie, but close enough) radio show today talking about the “war” on Christmas. The poor guy, in an attempt to at least sound somewhat PC, mentioned that not all people celebrate Christmas and therefore along with keeping Christ in Christmas, we should keep Rama in Ramadan. I wanted to facepalm, but both hands were busy driving my car. Wrong religion, radio guy, but nice try. I know! I’m sure the Hare Krishnas would love that, but something tells me that Muslims aren’t particularly attached to just those four letters. In defense of fundies, how many people do you think really know that X = Christ? Not fundies, I mean just in the general population out there. Probably not too many. I would dare say that MOST do not know that X=Christ! Most take it for granted that their “man of God” would not lie to them. 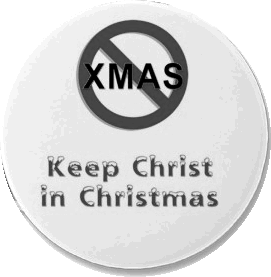 Most actually believe that X is a modern attempt to take Christ out of Christmas and making Christmas a secular holiday. Had a conversation about this the other day. The person was telling me that his fundy pastor said, that the “X” was “the worlds” way of defacing the cross that Jesus died on and “crossing” it out. Many won’t believe you, when you try to tell them differently either. Ahh, it was fun telling him about the Greek letters. His mind = blown. Seriously, what is his Kids’ Klub teaching him?! ooooo, wait until he tells them at church–h-h-h. You’re gonna get it…. Seriously let us know if there is any backlash on this. In the war on christmas, christmas lost. It has been totally conquered by money. I work in retail; i know of what I speak.